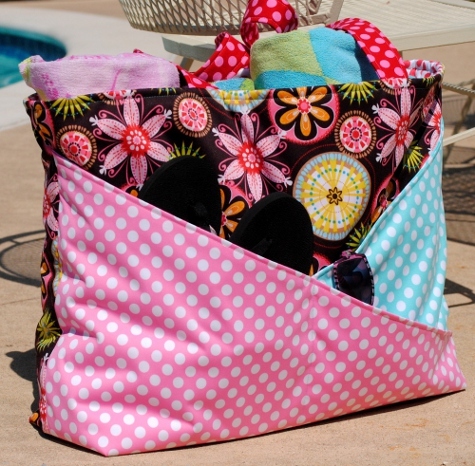 The Sunny Days Waterproof Pool & Beach Bag is #13 on my 52 Family Projects list, and I put together a tutorial so you can make one for your family, too! 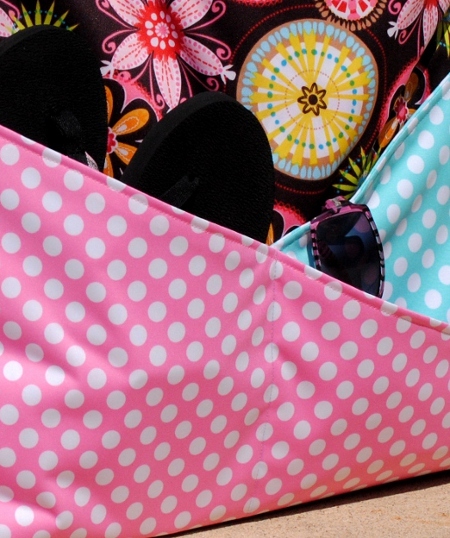 Do you feel like you have to pack a zillion things when you head out to the pool? I made this bag huge so it holds everything you could possibly need to have on hand . . . towels, sunscreen, water bottles, goggles, snacks, flip flops, sunglasses . . . These criss-cross pockets in the front work great to organize those things that you need to be able grab quickly. They look really cool, too! I put the tutorial together in an easy to read and print pdf. 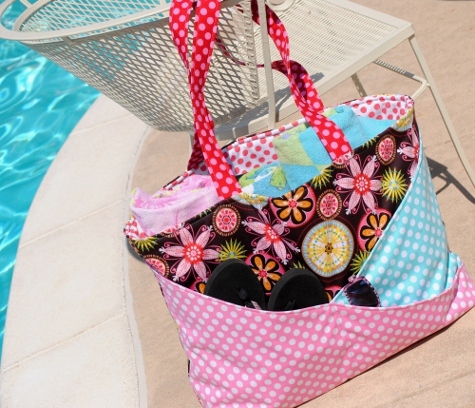 You can find it right here: The Sunny Days Waterproof Pool & Beach Bag. ooooh thanks! I’m going to have to try this when I finish what’s on the cutting table now! Wow, great tutorial! Thanks so much. I sooooo wish I knew how to sew…or even had a sewing machine to try and sew this. Could not figure out how to print the pattern for July. When I tried to clic on things that would take me to the pattern instructions it would just say click to delete when I hovered over a title. What am I doing wrong. Hi, Brenda! If you go to this post: http://fishsticksdesigns.com/blog/little-boys-shorts-at-hopeful-threads-and-the-free-mud-puddle-splashers-pdf-pattern/ and scroll all the way down to the bottom, right before the comments, and click on the little picture of my boys that says “The Mud Puddle Splashers”, it’ll take you to the pdf. You can either print it from there or save it to your computer. I’m going to try to make this bag for my sister in law who swims almost everyday with her kids. I was trying to figure out where to find the michael miller material and can’t quite figure it out. I’m in the Spokane, WA area but will be going to Seattle, WA as well. Do you know where, in those areas, I’d be able to find it? Also, what are the prices normally for the print material? I made your bag! Even though it’s not my kind of style for a bag, the girl I made it for loved it! She was looking for something big enough to haul swimming gear for 3 little ones, and your tote fit the bill. Thanks for the tutorial. I was looking for a pattern/idea for a larger project/tote bag for when I’m knitting a sweater. I didn’t need it to be waterproof, so I made mine out of cute quilter’s cotton with a thin cotton batting in between the layers for added stability. I also made mine a bit smaller, as I didn’t need it quite so big. It turned out adorable, and I can’t wait to show it off to my knitting buddies! Thanks so much for your generosity in sharing this pattern and tutorial with us. Awesome bag, still 3 years later. Fell in love with the fabrics too and had a hard time finding them in France now, but I did it . Thanks for a great tutorial!!!! Thanks for this pattern. Its so easy and fun! The finished product is cute and functional. What’s up,I check your blog named “The Sunny Days Waterproof Pool & Beach Bag A Tutorial & 52 (Family) Projects in 2012: #13” on a regular basis.Your story-telling style is awesome, keep up the good work! And you can look our website about تحميل مهرجانات شعبى 2017. Love this bag! Confused about one thing. Why would I need 5/8 each of the pocket lining fabric when the outer pockets only require 1/2 yard each and the same pattern piece for cutting the outer pocket and lining piece is used? What am I missing? Thanks for posting this tute. I will be making two of these for friends. It’s such a cute design. A fantastic read. Ӏ will certainlү be back. like yours nowadays. I honestly appreciate peeople like you! estoy de contrato con tu punto de vista y alimento igual.